Monthly Pen for June: Monteverde Artista Crystal Demonstrator. I’m LOVING my Artista pen. The Visconti ink ran dry so I filled it with De Atramentis Heather Violet. Such a great writer. My next monthly pen will be chosen on June 24. I wrote a post about my Elite 1745 in this post. This Sunday I plan to write about some journals I picked up this week in a moving sale. My friend had a birthday party this past weekend and we had a great time, seeing old friends, watching the hockey game and stuffing ourselves with great food. Her birthday present hasn’t arrived yet; fingers crossed it will this week! I ordered a Coleto Multi-pen on ebay for her. My massage therapist has been trying a new (to me) technique called Myofascial Cupping. I’ve had 4 or 5 treatments so far and the pain in my leg has been reduced by 90%. I am so grateful for this reprieve; I feel good and like my old self again. I definitely recommend it to Sciatica patients. 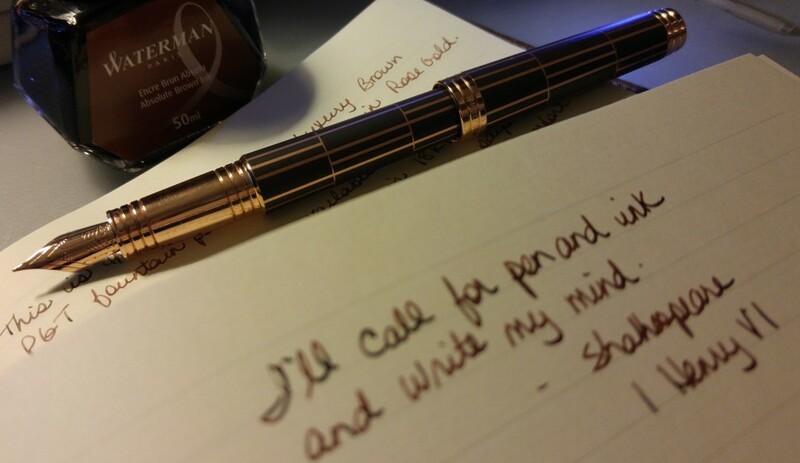 I find the monteverde a little small for my larger hands but it was a great writer, good choice. Can’t wait to see what kind of journals you found at a yard sale. I picked up a JournalBooks journal this past week. It’s strictly a promotional products company but the journal cover is emblazoned with BLACKLIST My new favorite TV show and character. I’m not expecting much from the paper with my fountain pens but we’ll see.